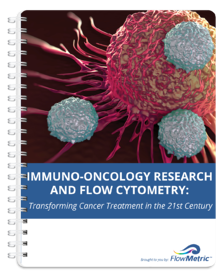 Flow cytometry is becoming a standard tool in clinical and translational immuno-oncology (IO) research because it allows researchers to monitor dynamic changes in the immune system and can be customized to study different cancers. Flow cytometry-based immunophenotyping assays using whole blood are especially well suited to IO research because various cells subsets can be profiled in a single assay including naive CD4+ and CD8+ T cells, central and effector memory T cells, regulatory T cells, B cell subsets, NK cells, monocytes/macrophages, and dendritic cell subsets. These assays can be used for evaluating all types of IO therapies including checkpoint inhibitors, adoptive cell therapies, and cancer vaccines. Consider these aspects of using a flow cytometry-based IO assay using whole blood as you plan your next research project. 1. You can do preliminary in vitro studies as well as preclinical or clinical studies using the same assay. Whole blood-based assays allow you to use the same sample source (peripheral blood) in all phases of your research. If you develop an assay for screening biologic or drug candidates, this same assay can be validated and used for monitoring responses during clinical trials. 2. You can confirm if a biologic or drug is depleting or activating a specific cell subset. IO therapies are based on stimulating or blocking specific cells of the immune system to treat a specific cancer. Flow cytometry-based assays can measure if a desired immune response is being triggered and can also be used to monitor how long such a response is sustained. 3. Undesirable immune responses can be detected. IO candidates are often selected because of an effect they have on specific immune responses. But off-target or undesirable responses may also be triggered by IO therapies. Whole blood based assays can be used for preclinical in vitro screens or testing animal models for undesirable responses like excessive cytokine responses or widespread immune suppression. These undesirable responses can also be detected during clinical trials, which may be critical for evaluating the progress of a trial or overall suitability of a drug or biologic candidate. Whole blood-based flow cytometry assays are valuable to all phases of IO research and development, from candidate selection to clinical trials. Consider adding this powerful tool to your next research project. Kohrt HE, Tumeh PC, Benson D, et al. Immunodynamics: a cancer immunotherapy trials network review of immune monitoring in immuno-oncology clinical trials. Journal for Immunotherapy of Cancer. 2016;4:15. doi:10.1186/s40425-016-0118-0.